Stéphane Caron and Yoshihiko Nakamura. RSJ 2015, Tokyo, Japan, September 2015. During the DARPA Robotics Challenge (DRC), robots were expected to solve a number of tasks under teleoperation by a human operator. 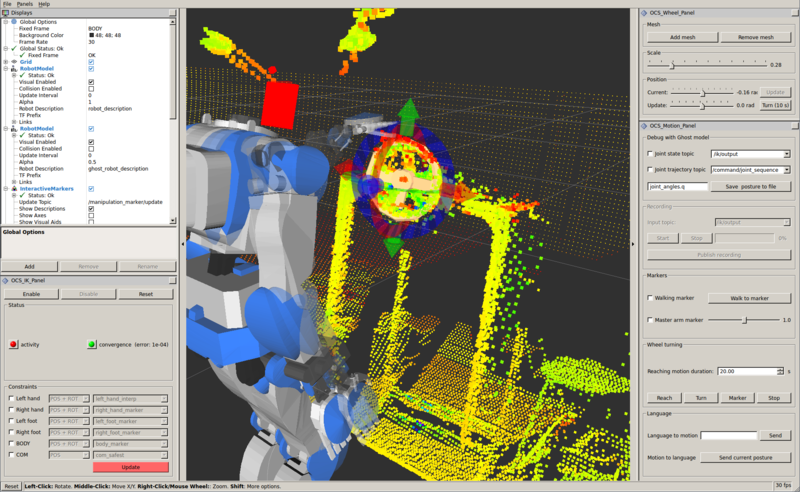 Limits in execution time and teleoperation bandwidth required teams to implement some level of autonomy on their robots, yet meaningful input could still be provided by the operator on a regular basis via the team’s Operator Control System (OCS). The purpose of the present paper is to report on the development of Team Hydra’s OCS for the DRC in the context of the valve-turning task. We describe the design of the system as well as the technical choices made, meanwhile pointing out the underlying research questions and directions for future work.